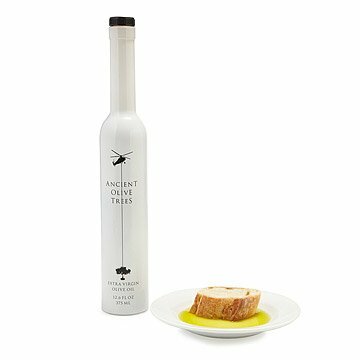 Fruit picked from transplanted Sevillano trees give this California-made olive oil its unparalleled flavor. More than just a palate-pleasing olive oil to soak into crusty bread, drizzle on caprese, or emulsify into herbaceous dressings, this Italian delight has an all-American tale. The story begins with majestic Sevillano olive trees planted more than a century ago in Corning, the olive capital of California. Arborists then airlift the trees via helicopter to orchards throughout the Western United States. To make each batch of sumptuous olive oil, every olive is picked and then pressed within hours, guaranteeing rich, unparalleled flavor with delightful notes of zesty lime and freshly mowed grass. The white glass bottle maintains superior freshness by blocking the precious contents inside from exposure to sunlight. Made in California. Birthday gift for a dear male friend who is a gourmet. He was very surprised and used it right away. Said it was great. I fell in love with this bottle due to the artwork on it(Virgin Oil was nice though too!) My son is a helicopter pilot and knew he would get a kick out of the bottle. He and his wife love to cook so she will love using the oil in their recipes and as a dipping oil. My father is a foodie and loved the gift! Very unique.